It definitely feels like autumn here in New York. Some serious rain washed away the last bits of summer on Thursday, so much so that I woke up this morning to blog and find myself sitting in my kitchen wrapped up in a polar fleece. Burr! So in honour of kissing summer goodbye some salmon was thrown on the grill last night (hey, it's not snowing yet!) and I made a simple, yet fresh salad to go along with the mix. 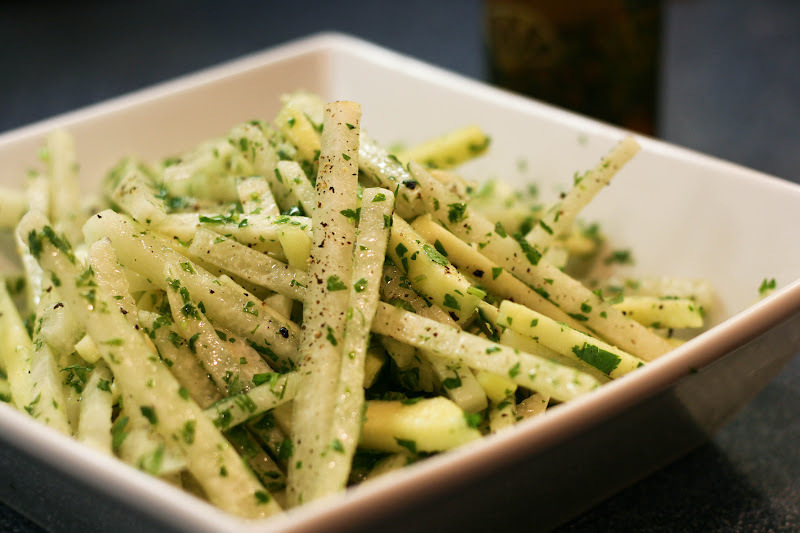 Jicama is one of my favourite things to add to salad. It is a root vegetable with a great refreshing crunch. When looking for jicama in your grocery, be sure to get a firm, dry one. I am really not a huge fan of salt, as you may have noticed. So just be aware that where there would usually be salt in most recipes, I have omitted it. Feel free to add a dash! Wash and peel the jicama and apple. Slice into 1/4" thick slices and place in a bowl. Finely chop the cilantro and jalapeno and add. Drizzle with the citrus olive oil. This is what really makes the salad fresh. Season with cracked black pepper. Toss. *The citrus infused olive oil is what really makes the dish. If you don't have any on hand, I would suggest going out and buying some or ordering some online. I buy mine from the Temecula Olive Oil Company along with a bunch of great balsamic vinegars. If that's not an option, I'd experiment with grating some lime peels.